So glad you dropped by to Flawed yet Functional today! If you’re new here check out some AIP and Paleo recipes here, get the low-down on my health and how I manage it here, and fun DIY projects here. For today, I have a problem that needs solving so I thought I’d run it by you all: how to store cast iron pans. I’ve learned so much over the years of the benefits of using cast iron (and I love how food turns out on them! ), but when it comes to the practical aspect of where to put them in my kitchen, I’m lost! Why in the world do I bother cooking on cast iron? It’s heavy, it requires a different type of cleaning than most pans (no soap! ), and it’s not ideal for all types of food (like very acidic dishes, i.e. tomatoes). While, there are many benefits to using cast iron pans, the two most important to me are (1) it puts iron into my food so I never struggle with low iron and (2) it heats up very hot allowing for better crisp and flavor in my cooking. There are so many other good reasons! Check out these lists for more information (1, 2, 3). On to the issue at hand! I recently received some new cast iron pans from my grandma’s estate, and I couldn’t have been more happy! I got a #9 skillet, a #8 flat pan (tortilla pan? ), a grill press, and an enameled dutch oven. Score of the century, right? 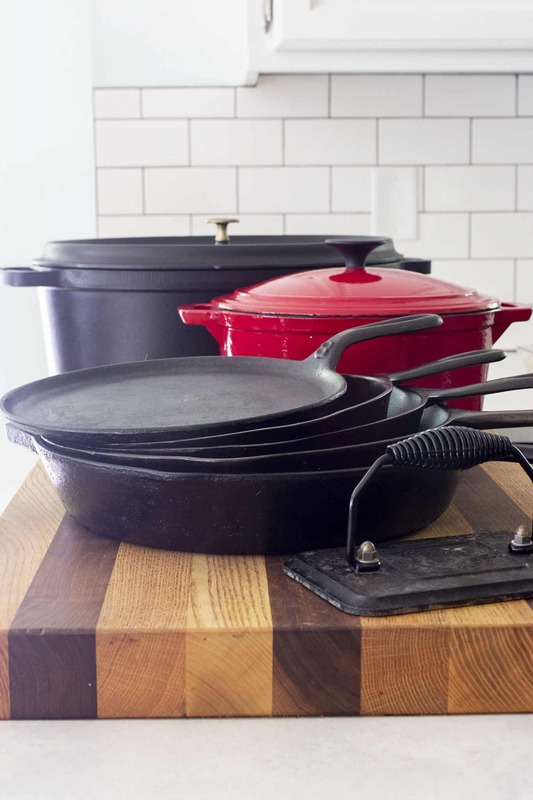 The only problem is now my cast iron collection looks like this…ruh-row. Now, I have a storage problem. (Perhaps, I should also mention that I have an entire set of Calphalon non-stick pans plus one more dutch oven.) I used to keep the 3 cast iron skillets that I use daily in the oven and the large dutch oven in the buffet in the dining room. Now there are far too many to put in the oven. The most logical place would be these two deep drawers where I keep my nonstick pans. I don’t use all of these pans anymore (because of copious amounts of cast iron :)), so I definitely need to purge some of those. But then the issue of nesting them, the weight on the drawer, and just plain fitting them in the drawer comes up. I took to the good ole internet to see if I could find any creative storage solutions. I love this first rack, but it’s far too large for my drawers. Although, ideally, I would fit them into the large drawers. 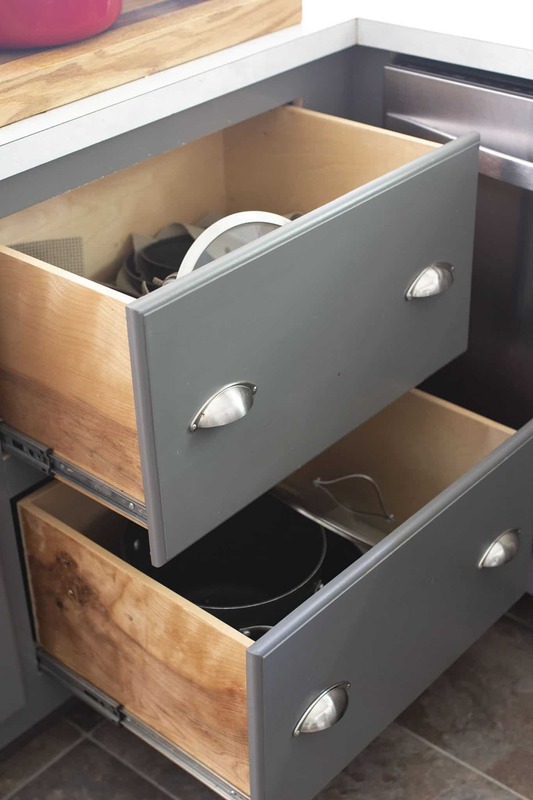 The drawers are 15″ x 20″ by 10″ deep. Hanging them on the wall is an idea, but I’m not sure I want them out in the open. I like simplicity and less clutter in my kitchen, so not completely loving this idea. This is my favorite idea, but I don’t have a cabinet big enough or a vertical rack short enough. Rats! 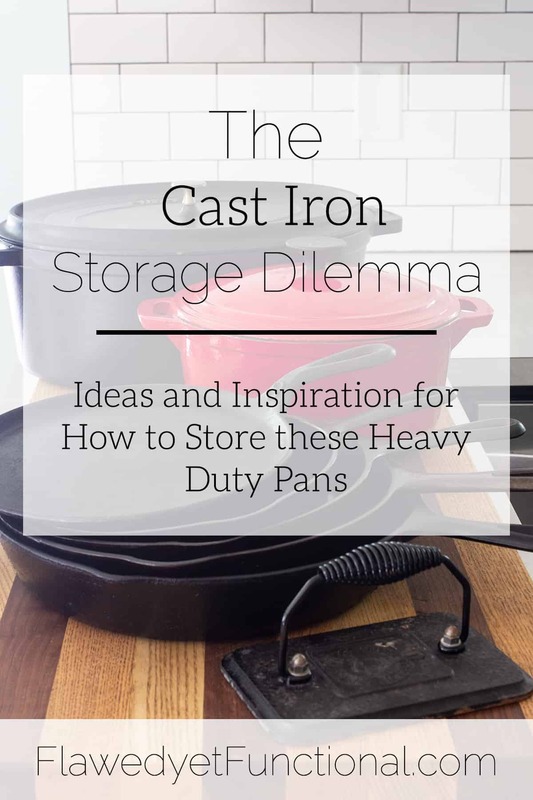 So there are my thoughts and ramblings on how to store cast iron pans. Lots of questions, not a lot of answers. I’d love your thoughts if you’d like to take a minute or two and comment. What is the best way to store pans?? What do you think? 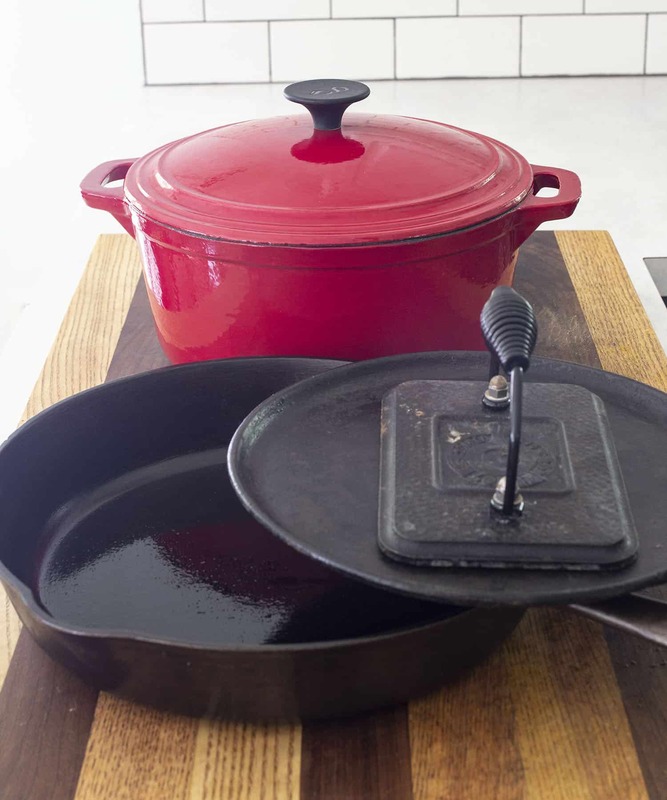 How do you store your pans (cast iron or not)? Do you have a great solution that keeps them accessible? How do you keep your pans from scratching each other?